Ok, so my CPU Lights on my T2 do not come on. This board features 4 bulbs all in line with one another and are essentially GI. Someone wired the connector to a controlled bulb so everything worked but not as it should. Looking through the manual they should be connected to J120 which is the bottom insert GI connection controlled by Q12. Here is my issue - I've looked through the manual and schematics and I don't understand exactly how to fix it. I can see in my photo that J120 (the higher connector, the item marking 121 refers to the lower connector) does not have anything in the 10th position (it is an 11 position connector with 11 marked on the left). So somehow I should get a wire to this connector? My other concern is that looking through the manual I think maybe other wires are out of place but I'm not certain. I could use a second set of eyes. This connector was clearly repined by someone and it may be wrong. Would appreciate any help. 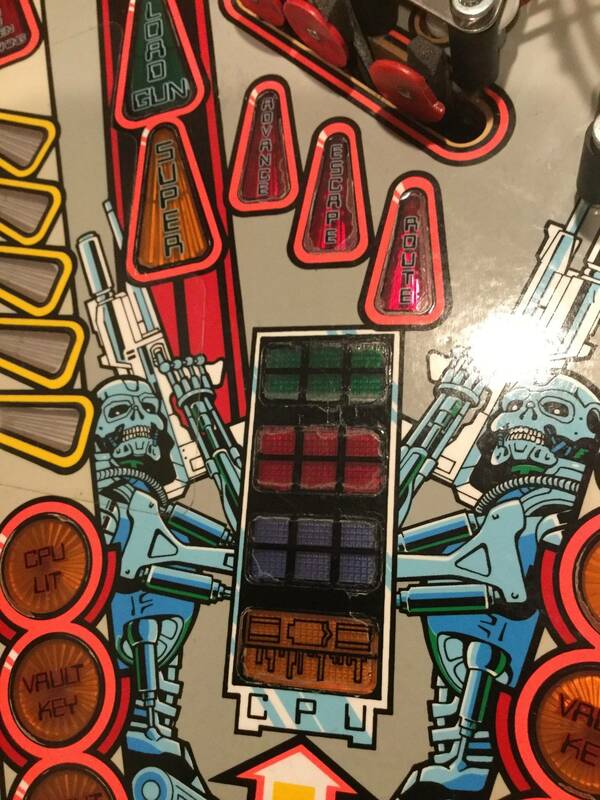 Note that I have found the wire to the connector underneath the playfield. Efforts to trace it up have proven difficult but the wire is somewhere. My first goal is to prove out where the wire needs to go and I'll worry about feeding stuff around later as appropriate. I also want to verify whatever is in that connector is correct because someone took red marker on some empty areas for some reason and I'm wondering why! If anyone has a T2 and wants to photograph their connector that would be helpful I think! Thanks in advance for any help. So there is no confusion when I say CPU lights I mean the game lights labeled CPU (photo below). I'm not talking about lights on the MPU. Remove the board, reflow solder to the pins the connector plugs onto. Reinstall the board - see if they work. If not check bulbs, sockets, power to the board. These are feature lamps and not GI. Why does the manual refer to them as GI? Also I have to go into GI test to find a way to activate them. Manual even specifies this. I believe they are lower GI. I’ll also note that I can get them to light when I jumper the board connector to other lights. It’s not a solder problem. Why does the manual refer to them as GI? Just noticed you are missing a connector - red circle, and a bulb/socket - yellow circle. Without the connector, nothing will light. The CPU lights in T2 are not GI lights. They are controlled lamps. All 4 come on when you enter payback time. 10 consecutive alternating ramp shots will activate Payback Time. The missing connector LTG pointed out is tucked just below in that wire loop. Thanks all. I wasn’t clear in my first post as I’ve already fixed and plugged that connector in. If everyone could please look at the driver board where that connector leads to they would see where I am stumped. That is what my question centers around. If anyone has a T2 or can read the schematics that would answer my question. The cpu lights are GI, they're their own string. I know in my post I mentioned this connector. Zaza you're right up there with LTG bro....you both need a paypal account so people can donate. .you both need a paypal account so people can donate. we're gonna be rich .... well, it's fun to help so now and then. J121 connector in your picture needs to be replaced. It looks like someone hacked the IDC connector with crimp-on pins. Both the leads for the insert in question are the ones that have been hacked. Definitely not a hack. Much more reliable to do that way than the original IDC pins. 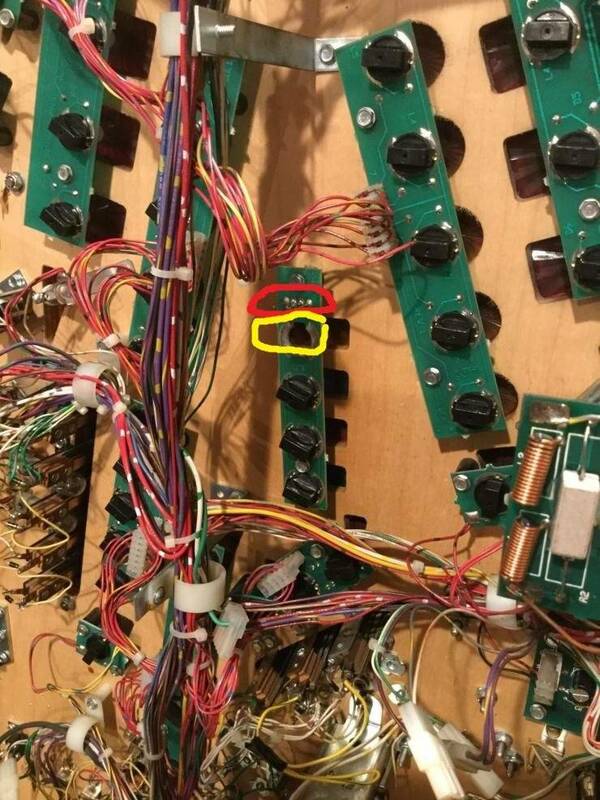 As noted previously the light board under the playfields doesn't have its connector attached. I’m using the diagram posted by zaza and the article Lloyd posted to to work through this issue. The connector to the light board was repinned and plugged in before my post was made. I confused everyone in my post by showing that photo with it unplugged. This didn’t fix my issue. My question was whether that connectors other end (that goes in driver board) was missing somewhere. I verified continuity from said connector to driver board. It appears plugged into J121. I thought it had to be in 120 also... it currently is not. Using the diagrams for the green GI I verified continuity between all the spots the guide suggests. No issues. With GI test on full brightness I verified I’m not getting more than 1-2v AC at the connector. I also noticed this appears to be the case on the driver board. Guide points me to an issue with the transistor or another part I’ve never worked with before called a triac?? That is where I am now. I haven’t pulled driver board to carefully test either part since I don’t have one on hand and didn’t want to take game apart without having it. J120 isn't pinned correctly. Use zaza's diagram to get the wires to the correct pins. J120 may have been pinned wrong to bypass burned header pins. Remove J120 and inspect the pins, or post a good photo of the pins. With J120 removed, see if your "CPU" lamps work. 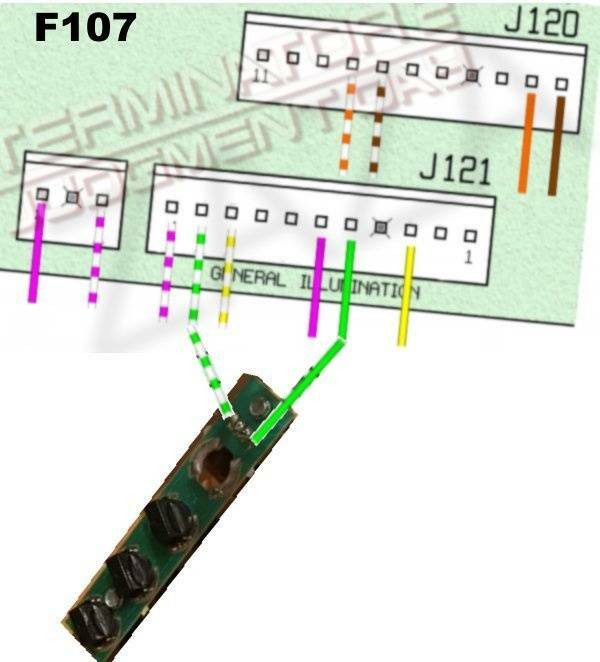 J120 and J121 are exactly the same on the board, so it doesn't matter which the manual says the connector should go to, they're the same. The wires do need to go to the correct pins though. Got it. I ran out of 11 space molexes so I’m going to order some and do it this week. Thanks for the help. I’ll update soon! 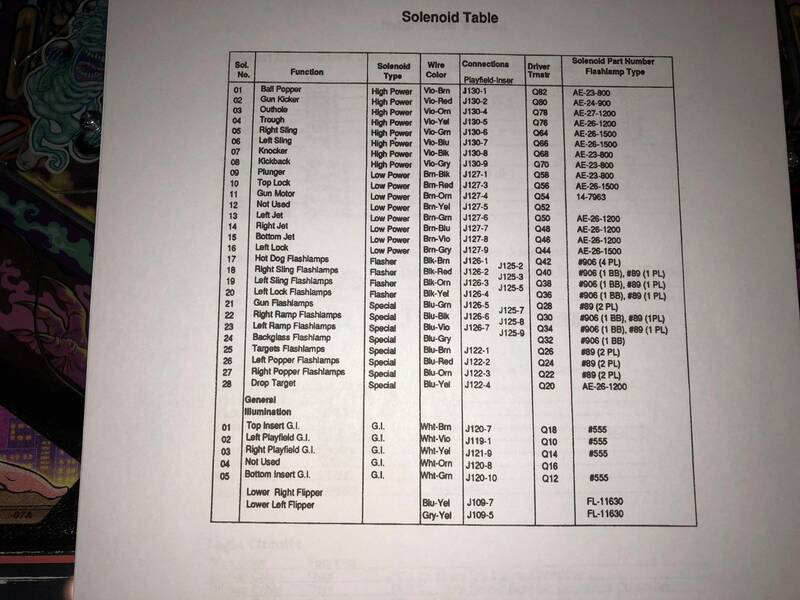 Left CPU and right CPU lamps (lamps 61 and 71) are part of the lamp matrix!!!! When I see the photo in post#1, imho his J121 is wired correct, only J120 is wrong. If he disconnects his J121, the CPU-light should work. If not, imho the fault is with J115. So using crimp pins in an idc housing is not a hack to you? If you are using the Molex crimped pins, push in the back part of the pin that is locked against the plastic housing and pull out the pin and then you can reuse the plastic housing. Whether or not you damage the pin or not, depends if you used the right technique to get the pin out and then you can move it over to the correct spot. If you damaged the pin, you can cut off the old one and crimp a new pin. The far superior Molex Trifurcon pin fits perfectly in the housing with the IDC pin removed. If you think installing anyPin NVRAM in a game, or changing rusted and pitted balls with new, is a hack, then yeah, maybe you'd consider better pins attached to the wire more reliably a hack. Otherwise no, Trifurcon pins in the IDC housing is definitely not a hack. I was not aware of this, but maybe it's not even a trifurcon pin? Also, the fuse at F109 looks discolored at best. Is this fixed yet, btw? Not yet. I likely can’t work on it until this weekend based on my schedule. I will update the thread. I'm having the same exact issue with the "CPU Lit" pcb. My machine is un-modded, and all the connectors are pristine. Is it possible to use an external DC power supply to test the 4 bulb-pcb by running 6.3V through it? So I repinned it as best I could according to the diagram (colors on the solid brown are faded but process of elimination led me to what you see in the photo. CPU string still doesn’t work. Also now my back box GI doesn’t work. Move them back and it works as before (no cpu but backbox works). I'm back to wondering whether I'm missing wires as the wires in my J120 do not match colors as far as I can tell... very puzzling issue here. Reallly make sure that J115 is connected like the pic from post nr. 8 (exflexer)! In my case position 10 & 11 were not connected. As far as hacks go, this is incredibly minor. Most of the time you see people take an IDC connector from somewhere else chop the wiring and twist it together. The fun ones are the ones where they actually go to the trouble of using heat shrink tubing, but don't bother to solder the actual joint. Check those fuses with your meter. F109 and F106 look questionable. Try swapping where J120 and J121 are plugged into the board to see if the problem changes. If it does, you probably have a bad trace on the board. Reallly make sure that J115 is connected like the pic from post nr. 8 (exflexer)! In my case position 10 &amp; 11 were not connected. Thanks for this suggestion. The issue is that my colors aren't even close... so my game may have a worse hack and this could be my issue. If I read the post you lined too correct it seems to suggest I should loop a few connections together which makes sense given the schematic and the fact that many of the GI loops are the same voltage... ??? Confirmed all fuses are fine out of the game with my meter. Just take a picture of J115 and let us see that. I've been monitoring this thread and see a lot of info being passed on, but there are a few specifics that aren't clear. 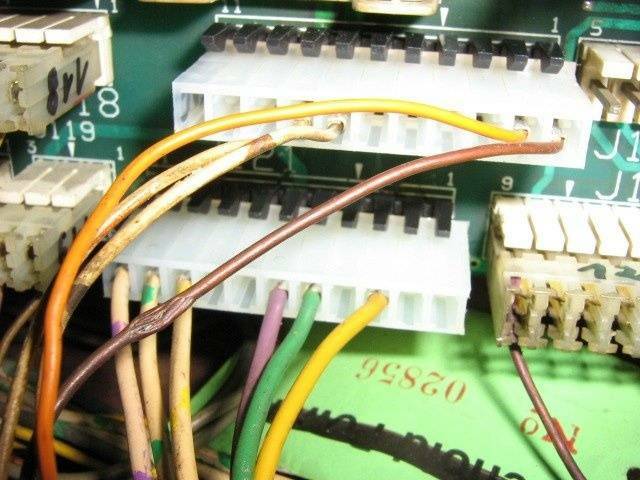 This can be a wiring issue, a connector issue or a board issue with a burnt trace, cold solder joint or logic on the driver board or a burnt trace or cold solder joint on the lamp board. With GI test on full brightness I verified I’m not getting more than 1-2v AC at the connector. How are you measuring this? Your DMM should be set to AC Voltage with one lead on J121-5 and the other at J121-10. You should be seeing 6-7 volts AC. This will tell us if it is a potential board issue or a wiring issue. I'd measure at the header pins on the driver board and not the back of the connector to be positive that it is not a connector issue. If the power is not there, verify continuity from J115-5 to Fuse F107 to J120/J121-10. Verify continuity from J115-10 to the top leg of Q16. Verify continuity from the middle leg of Q16 to J120/121-5. This will tell us if you have a broken trace or cold solder joint somewhere on the driver board. You can also test for the AC voltage at connector J115 with one lead on J115-5 and the other at J115-10. You should be seeing 6-7 volts AC. This will tell us if it is a transformer or transformer connector issue. I'd also, check for a cold solder joint at the pins on the lamp board and continuity from the same pins to the first bulb on the lamp board. I verified continuity from said connector to driver board. 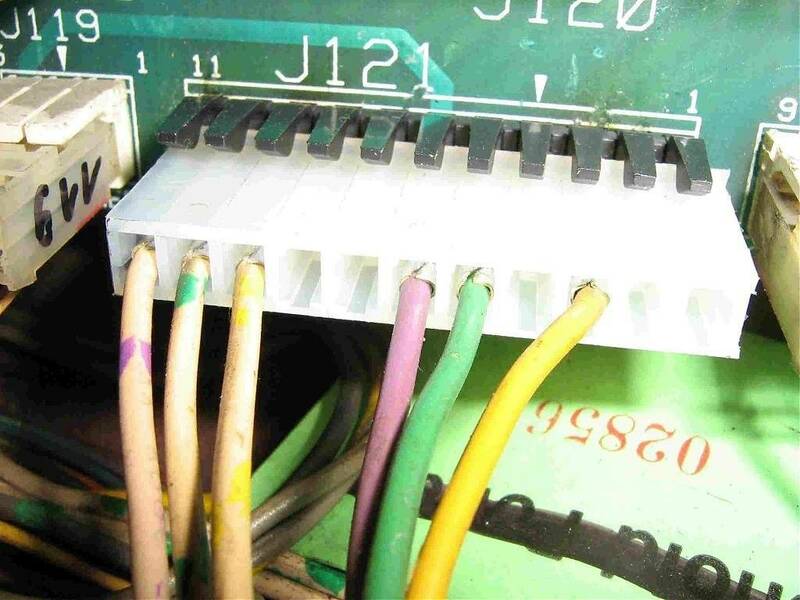 BOTH the green wire and white with green tracer wire have continuity from the driver board connector to the lamp board? Both need continuity, green to green, white/green to white/green. 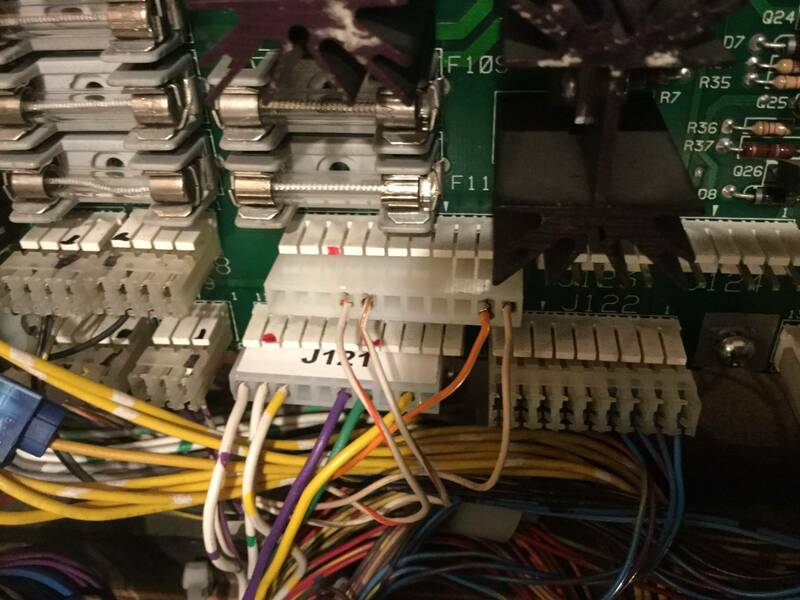 If you mean that you swapped the connectors for J120 and J121 and this was the result, you probably have either a colder solder joint or burnt trace on the driver board. 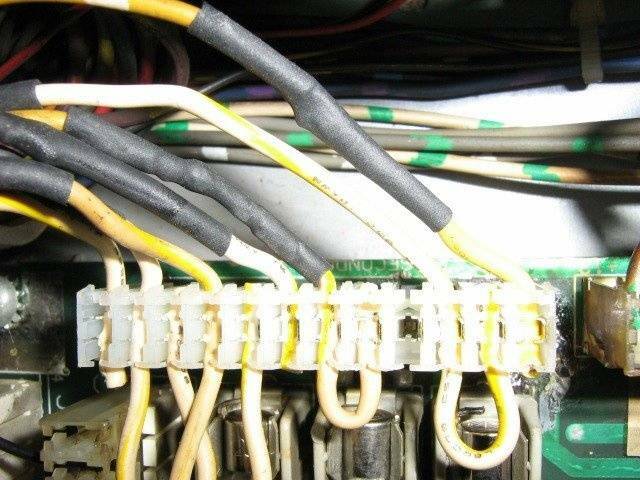 Your problem is with the green wire and white with green tracer wire circuit. 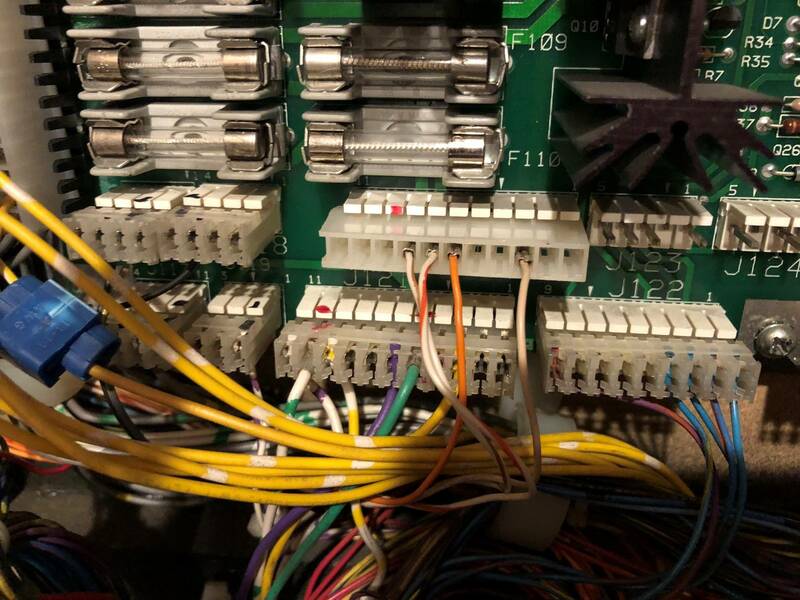 From your last picture, those appear to be present and correct at the connector on the driver board. If you have continuity from the green wire at the connector on the driver board to the green wire at the connector at the lamp board and the same with the white/green wire at the connector at the driver to the connector on the lamp board, you're ok.
My recommendation is to be very specific and as to what you have done/tested and how you tested it. If you're not testing things correctly it'll be more difficult to find the problem.